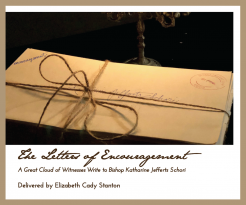 This book is the collection of the twenty-three Letters of Encouragement sent to the Most Reverend Katharine Jefferts Schori by those who would like to have supported her in their lifetime but could not. Bishop Jefferts Schori was the first woman elected as a primate in the Anglican Communion. She was elected at the 75th General Convention on June 18, 2006, and invested at Washington National Cathedral on November 4, 2006. She served as the Episcopal Presiding Bishop for the term of nine years. By the immeasurable effort of Elizabeth Cady Stanton (November 12,1815 - October 26, 1902) these letters were gathered and delivered to Bishop Jefferts Schori with the great hope that their witness might be a source of strength to her during her years in office. The Letters are reprinted here in their entirety.